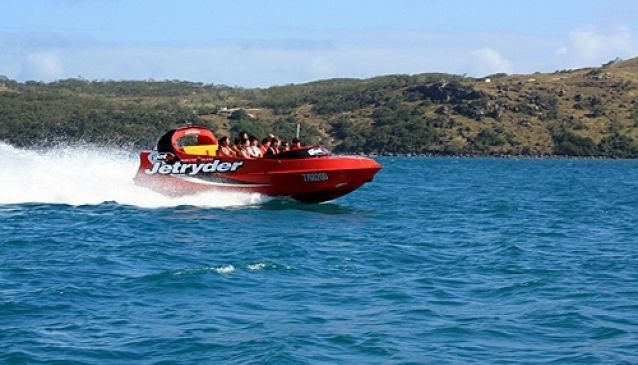 Hold onto your hats and smile as you prepare yourself for a ‘thrilling’ 30 minute jet boat ride around the protected waters of Hamilton Island. The Jet Ryder, a mean and powerful 420 H.P 5.8 litre turbo charged diesel engined monster, was specially built for the Whitsundays. Couple its massive engine with the 25,000 litres of water per minute which is pumped through its jet unit and this baby produces enough thrust and adrenalin to last a lifetime. Be prepared to get VERY wet when you are thrown into fishtails, twists, spins and power stops, and even don’t bother with food until after your trip.